Weston is using Smore newsletters to spread the word online. The colonists revolted against England because they were tired of all the taxes that England was making them pay. Boston was a huge contributer to flaring patriotism through the 13 colonies through angry newspapers, public speakers, peaceful and violent protest groups, and propaganda. 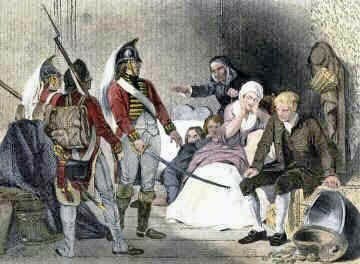 Overall I think that the colonists had every right to rebel against England. The Navigations Acts were made by King George III to make England richer by limiting the colonists trade. 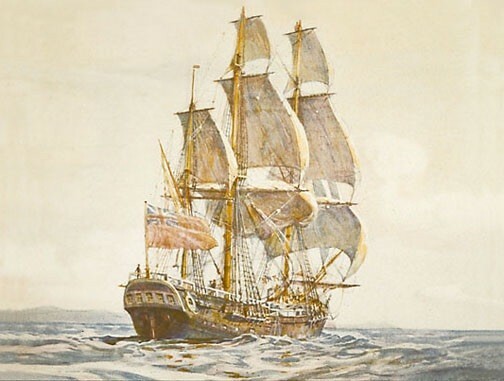 One of the rules of the act were that only English ships could be used for trade, if you wanted to send something to another colony you would have to send it to England first, and you could only buy manufactured goods from England. The didn't like this law because it was inconvenient and frustrating. Some colonists would smuggle items to other colonies so they didn't have to send them to England first. The Proclomation of 1763 was made by King George III that prevented the colonists from crossing the Appalachian mountains into the new fertile land they acquired from winning the French and Indian war. 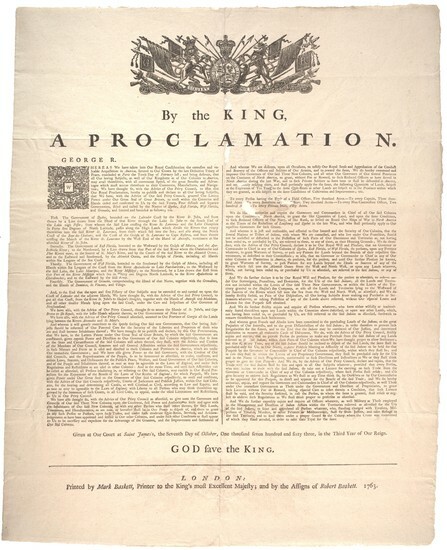 The King issued the Proclamation to prevent future war with the Indians because they were still paying off debt from the French and Indian war. The colonists didn't like the Proclomation because they wanted to use the fertile farmland of the Ohio River valley. The colonists would still settle west and they started to dislike the British even more. 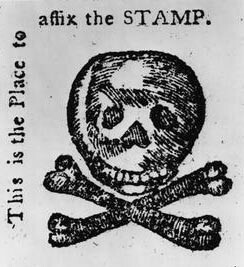 The Stamp Act was made to help England pay off the French and Indian war debt by taxing all paper products in the colonies. The Stamp Act was very bad for thecolonies because it put newspaper companies out of business because they couldn't afford the tax so people couldn't get their news. Sam Adams created the Comittiees of Correspondence to orginize peaceful boycotts against the Stamp Act. The Stamp Act Congress discussed how they wanted the tax money to go to the colonies and benefit them and they also wanted the taxing to stop in general. King George eventually stopped the Stamp Act because of the boycotts and all of the complaints. The Quartering Act was an act that made the colonists house the British soldiers. The soldiers could also search any colonists house with a blank search warrant. The colonists hated this rule because they had to feed, house, and clothe the soldiers which wasn't only expensive but the soldiers were rude and disrespectful to the colonists. The Townshend Acts put a tax on cloth, glass, tea, and paper to pay for military costs. 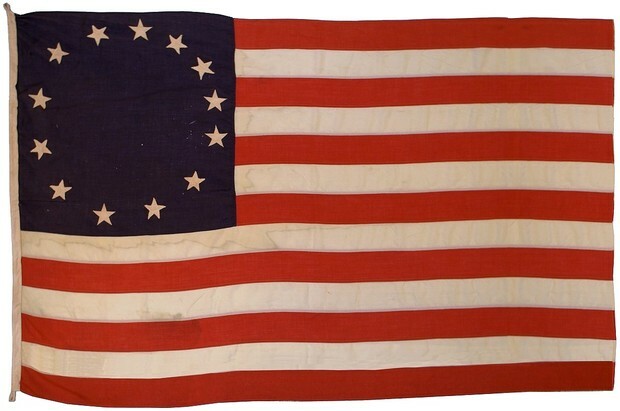 A group of women called the Daughters of Liberty rebelled against the Townshend Acts by making their own cloth and giving them to the colonists. A group of men called the Sons of Liberty rebelled the Townshend Acts by attacking tax collectors and other british officials. By 1770 the all of the items that were taxed by the Townshend Acts weren't taxed except for tea. 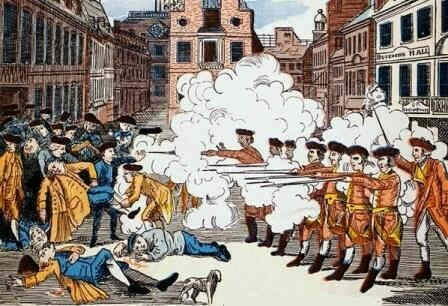 The Boston Massacre happened on March 5, 1770 when a bostonian started to argue with a British soldier. The argument got more violent and more bostonians and soldiers started until an angry mob formed. The mob got so violent that the soldiers fired at the bostonians and killed five people. Sam Adams made a political cartoon of the Boston Massacre by making it look like the soldiers were trying to ruthlessly kill the bostonians and the commander telling them to and by calling the act a "massacre". John Adams (Sam Adams cousin) defended the soldiers in court. The Boston Tea Party started with the Tea Act witch only let colonists buy tea from the British East India Company witch gave them a monopoly over tea. 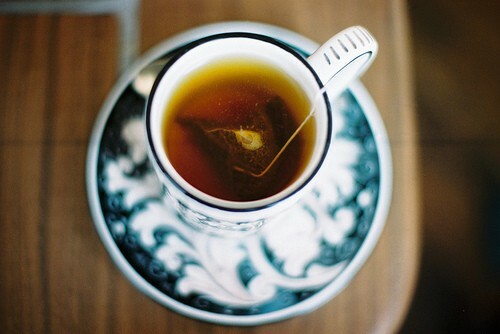 Even though the Tea Act made Tea cheaper the colonists still hated it because they had to pay taxes to Europe. The Sons of Liberty responded to the Tea Act by dumping 340 boxes of tea overboard. The Coercive Act was made to punish the colonies for rebelling against Europe. The colonists called these acts the Intolerable Acts because they thought the King had no right to issue these acts. 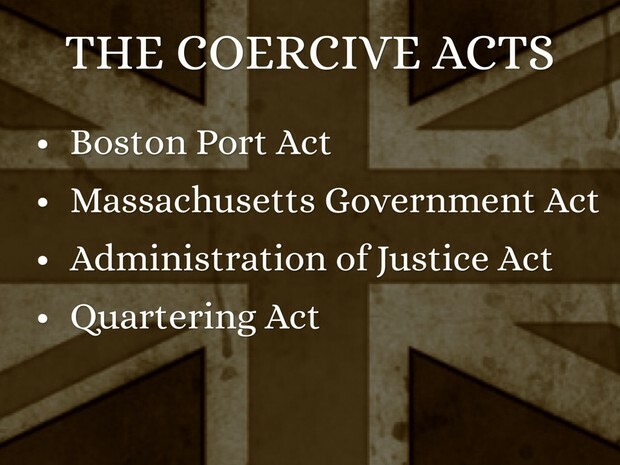 The Coercive Act closed all of Boston's ports were closed, no public meeting were allowed, more troops moved into the colonies giving Britain more control over the colonies, and the Quartering Act was strengthened. The colonies then became more united by helping Boston and flaring patriotism throughout the colonists.